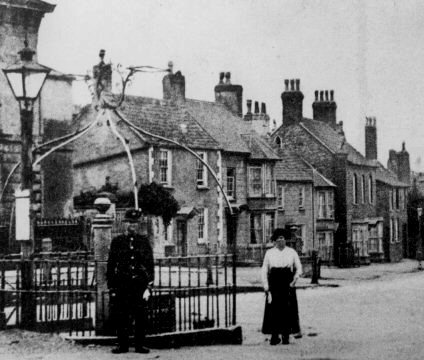 The photograph above shows the top of Castle Street in Thornbury where it joins The Plain as it was in the early 1900s. The house which is now number 1 Castle Street can be seen in the background immediately between the policeman and the lady. The earliest owner of this property that we appear to have identified is John Box. Click here to read about John Box. The earliest indication that we have at this time of who actually occupied the house is in a Rent Roll of Borough Rents paid by freeholders to the Mayor of Thornbury which was drawn up between 1807 and 1810. Here the tenant of John Box is given as William Pearce. This is not an uncommon name and we have been unable to identify him so far. From about 1812 to about 1819 the owner of the house John Box may have lived there himself. Richard Gwynn – from 1819 to 1826 the house was occupied by Richard Gwynn. Read about Richard Gwynn. Edward Pearce – in 1827 and 1828 the land tax records appear to show that the property was occupied by Edward Pearce. This may be the same Edward Pearce that was living next door at 3 Castle Street from 1829. John Cook – in the land tax Rrcords of 1831 the house appeared to be occupied by John Cook. We cannot identify John Cook. Margaret Carter – the 1840 Tithe Map shows 1 Castle Street as Plot Number 42 occupied by Margaret Carter. The 1841 Census shows that at this time Margaret Carter was aged about 40 and she was living with her brother, Henry Carter, who was aged about 45 and a schoolmaster. There was another gentleman living in the house whose surname is not clear but whose first name is James. He is said to be of independent means and aged 70. Margaret was born 10th March 1796 and was the daughter of John and Mary Carter. Her brother Henry was born 10th March 1792 and baptised September 26th 1792. In 1839 Margaret’s brother, Henry became the master of the National School (later St Mary’s School). He married Ann (or Sarah Ann) Whittard, the daughter of William Whittard, a mason on 15th October 1843. He was described as a bachelor and a school master when they married. By the 1851 census Margaret Carter had gone to live in St Mary Street with her brother Henry aged 55 and his wife Ann Carter 31 and their three children aged five, three and one. Margaret was aged 52 and a spinster. She died 13th January 1859 aged 63 and was buried in Thornbury. The census records of 1851, 1861 and 1871 show that Henry continued as schoolmaster through all these years and that his wife, Sarah Ann, was schoolmistress in spite of having to bring up their eight children. Henry died on 4th September 1876 aged 84. Ann died on 19th January 1887 aged 66. Both are buried in St Mary’s Church in Thornbury. In the 1851 census the house appeared to be uninhabited. John Eyles. The 1856 Trade Directory shows John Eyles lived at “The Plane” trading as a plasterer and painter. The 1859 Rate Book shows John as the tenant of a property owned by Thomas Osborne Wetmore further up the High Street in the vicinity of the Market Hall. However the 1861 census clearly shows John Eyles 37 from Old Sodbury living at what became 1 Castle Street. We cannot explain why he appears to have moved back to the house after the death of the next tenant Isaac Philpot. He was a plasterer painter and tiler. His Thornbury born wife Louisa was aged 27. They also had a baby, two month old Elizabeth Ann. Note, in the 1861 census John Eyles appears to have been sharing the house with a widowed fundholder, Sarah Surridge, aged 64 who was born in Worton, Wiltshire. Sarah had recently acquired the ownership of what later became 49 High Street which had been used by her son-in-law, James Henry Hockley as a baker’s shop and bakery. The Scribes Alcove website shows that John Eyles was the son of Thomas Eyles a stone cutter who was born on 5th September 1857. His wife was Louisa (nee Bevan) aged 24, the daughter of James Bevan a carpenter. In the 1851 census Louisa Bevan was a “visitor” aged 13 and staying with Hester Olive in the High Street. She was already a dressmaker. John Eyles and Louisa Bevan were married on 5th September 1857. We believe that they moved away from Thornbury by 1863 because although Elizabeth Annie Eyles was baptised in Thornbury on 7th July 1861, their next child Thomas Ernest Eyles was baptised in Falfield in 1863. The 1871 census shows that John and Louisa had moved to live in the Post Office at Falfield where he was postmaster and painter. They had three children in the 1871 census: Ann (possibly the Elizabeth Ann) was 10 and born in Thornbury and two more children who were also born in Falfield: Oliver James aged 6 and John 1. Sadly, Thomas Ernest Eyles had died aged 5 in 1868. Isaac Philpot – the 1859 rate book shows the house was occupied by Isaac Philpot (the spelling is very variable but we have decided on this version for consistency). Isaac was baptised on 10th May 1826 and was the son of a basket maker William Philpot and his wife Elizabeth. Isaac’s father William died on April 20th 1849 aged 51 years and his mother Elizabeth died on July 22nd 1852 aged 57. Isaac married Angelina Cook, then aged 23, on the 29th October 1853 in Thornbury. Angelina was the daughter of a farmer James Cook of Kingswood. The notice of their wedding that appeared in the Bristol Mercury of November 12th 1853 said that the family’s farm was Nind Farm near Wotton under Edge. They had two children baptised in 1855; Elizabeth Ellen Cook Philpot on 7th January and Mary Eliza Philpot on 7th October. Mary Eliza died aged 1 year 9 months and was buried on 31st May 1857. A daughter Ann seems to have been born in the March quarter of 1857, although we have not found the record of her baptism. Isaac continued the business of basket and sieve making that his father had carried on before him. On September 2nd 1854 Isaac advertised his business to let. It was said to be “a very old established basket and sieve making business with every convenience.” Anyone interested was told to apply to Isaac Philpot High Street Thornbury. This business was probably carried on at the bottom of the High Street next door to the White Hart. In 1858 the White Hart and the house next door to it were both demolished to make way for the new bank. We think the house stood in the small space on the left on the left of the bank that is partly occupied by disused bus shelter. The demolition was referred to in a poem of that time in the local dialect. A son called William John Philpot was baptised on 31st March 1861 after the death of his father Isaac who died on 20th October 1860 and was buried on 28th October aged only 35 years. Abia Shearman. The 1867 Rate Book shows only occupiers, in this case Abiah Shearman. There is an Abia Shearman in North Nibley in the 1861 Census. He was living with his father George who was aged 78 and an agricultural labourer. His mother Eleanor was aged 69 years. Abia at this time was aged 32 and like his 38 year old brother Obed he was a basket and sieve maker. On 26th November 1867 Abia married Eliza Barnett in Bristol. We have not yet traced any more information about this man who appears to have taken over Isaac Philpot’s business. John Barber. The 1869 rate book shows John Barber.as the occupant. Mrs Poole. The 1871 rate book has Mrs Poole. It is possible that this was Mrs Elizabeth Poole who in the 1871 census was living in the High Street. In the 1871 census the house next to the bank was uninhabited. Thomas Gully Latter. The census of 1881 shows that the family inhabiting the house then was that of Thomas Gully Latter a butler aged 54 with his 53 year old wife Mary Ann. Living with them at this time was their daughter, also called Mary Ann, who was aged 13. According to this Census they were all born in Thornbury. Thomas was born about 1826 in Olveston. We suspect that Thomas was the son of George Latter, a coachman and his wife, Ann. In the 1841 census they were living in Rudgeway, whilst Thomas was already working away in service in Cote, Westbury on Trym. In the 1851 census Thomas Gully Latter was a footman in the home of William Osborne Maclaine at Kyneton House in Kington. Thomas married Mary Ann Shea in the Bristol area in the September quarter of 1852. Their son Archibald was born in the December quarter of 1854. At the time of the 1861 census Thomas and his family were living at 38 High Street. The census describes Thomas Latter as aged 33, a domestic servant from Olveston. At that time he was living with his wife Mary Ann a 32 year old from Berkeley and their children, a son Archibald aged six and daughters, Kathleen five years old and Emily aged one. Emily, who was actually baptised Francis Emily on 3 July 1864, sadly died aged six on the 18th June 1865. The young Archibald Latter must have been a good student. He was accepted into Thornbury Grammar School in 1868 as a free scholar. The 1871 census appears to shows that Thomas and the family were living at the house which later became known as Threeways 56 Castle Street. He was sharing the house with Thomas Liddiatt a shoemaker aged 46. Archibald had become a harness maker. He was aged 16. The 1876 and 1877 rate books show that Thomas Latter was renting 1 Castle Street from John Ridd. They were still in this house in the 1881 and 1891 censuses. In the 1891 census Thomas was then aged 65 and described as a retired butler. Thomas may have worked as a butler for William Osborne Maclaine for most of his working life as in writing his last will and testament in 1892 William had made a bequest to Thomas Gully Latter. However Thomas was unable to benefit from the bequest as he died on 24th May 1905 pre-deceasing William. In 1895 Thomas’s daughter, Mary Ann married Bernard Pursey, a Poor Law clerk. The following year on August 11th, his 39 year old daughter Katherine married a widower John Joseph Amies. In 1901 Thomas was still living in the house and this Census shows that his birthplace was Alveston and that Mary Ann was from Berkeley. Thomas Latter’s name appears in Trade Directories until 1904. The records of St Mary’s Church in Thornbury show that Thomas Gully Latter died aged 79 years on 24th May 1905. It appears that his widow, Mary Ann, may have moved to live in Cricklewood, London as she died there aged 82. She was buried in Thornbury Cemetery on 8th February 1909. The 1905 rate book shows that the next occupant of the house was Mary Wetmore who was a tenant of Frederick Exell. Prior to this time, Mary had lived at 14 Castle Street, Bank Cottage. Mary Wetmore died 23rd February 1911 aged 89. Mary was said to have died at her residence in Castle Street. We are not sure at this time where that would have been. Robert Comely – by the 1910 rate book the occupant was Robert Comely who was also a tenant of Frederick Exell. In the 1910 Directory Robert Comely was a solicitor in Thornbury. The parish records show that Robert was the son of Robert and Elizabeth Comely nee Cullimore and he was born on 6th February 1876 and baptised on 17th April 1876 in Oldbury. Robert was admitted to the Thornbury Grammar School on 18th January 1886. The 1901 census shows that he was born in Cowhill near Thornbury and that he was a 25 year old law student living with his widowed mother Elizabeth and sisters Elizabeth and Mary in Clifton, Bristol. William John Williams. The 1911 census shows that William John Williams a harness maker aged 30 lived in the house with his family. William was born in Bedminster. The census shows that he and his wife Eliza from Kington had been married eight years. They had a lodger, Thomas William Nelmes, a butcher, aged 20 from Hill. They also had three children; Hilda aged six, Arthur Frederick aged five and Dorothy Helen aged one year. The Williams family may not have lived in Thornbury very long as only the last child Dorothy was born in Thornbury. Arthur had been born in Blandford in Dorset. When Hilda May Williams started at St Mary’s school in May 1910 her date of birth was given as 2nd May 1904 and it was said that her previous school was in Rudgeway. She left the school in 1916 to go to Tytherington. Arthur Frederick William started at St Mary’s school at the same time as Hilda. His date of birth was 2nd October 1905. He stayed at the school until 1919 when he started work. William John died aged 35 and was buried in Thornbury Cemetery on 11th May 1916. Although the family left 1 Castle Street, they seem to have stayed in the area. Dorothy Helen married Harry A Pitts in 1939. Harry was a police constable in Thornbury and a newspaper report of 1929 shows he was very successful at the County Police Sports. Hilda Williams married Joseph Pavey in 1949 when he was in his 60s and she was 45. The special register compiled in 1939 in preparation for the war shows Hilda and her widowed mother, Eliza, were living in 30 High Street with Joseph Pavey.